It all started with a past year’s Quilt Festival. 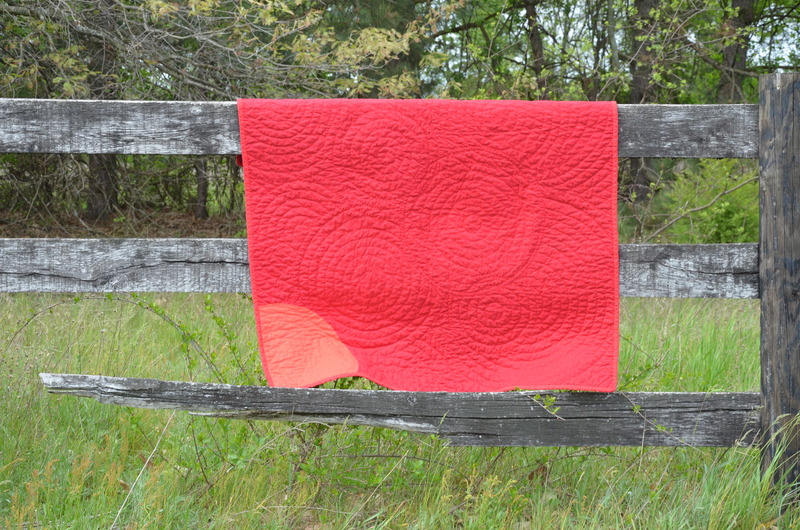 You look at hundreds and hundreds of quilts, finding so many ‘new to you’ blogs to follow. Some you find an attachment to and add to your Google Reader. It’s so exciting to link up with others who have similar ideas and creative outlets. This year’s quilt stated with following a new blog. One of her regular columns is one of pattern choices for the modern quilter. When she threw this pattern idea out there, I knew I needed to figure out how to do it. I knew I could do this, because I had a secret weapon. My helper. My youngest daughter. She was finishing up her senior year of college, majoring art with an emphasis in graphic design and had a much better understanding of how computer drawing works. She took Brigitte’s idea and turned it into a pattern. Since she could make it any size we decided on, I opted for 44″ square. Frugally speaking, one single width of a piece of backing fabric would make the perfect size for a wall hanging. And everyone needs a fresh wall hanging. We weren’t sure if all the fabrics were exactly what we had in mind, based off the Kona swatch card, but we would try and try again. We had lots of options and playing to do. Can’t you just visualize it based on the way the fabrics are layed out??? You have to dive in and start somewhere. I printed two copies of my pattern and taped them together. Using one copy, that Amanda colored, as pattern pieces, mentally adding my 1/4″ seam allowances. Then used the other, as a whole, to keep track of where each color went. Where the colors overlap I was aiming to create the appearance of transparency. When some colors didn’t work, as I had originally hoped, I changed colors. If you were to want to attempt to copy mine, do not use the colors labelled in my pictures. Well, you could, it just won’t turn out the same. While I did exclusively use Robert Kauffman Kona cottons, some of the colors I went after weren’t available and others, when I saw in person, up against their neighbors, didn’t look like I thought they should. That was another pattern confusion, all its own. Finally, I got it put together, which was not easy, but easier than I dreaded. 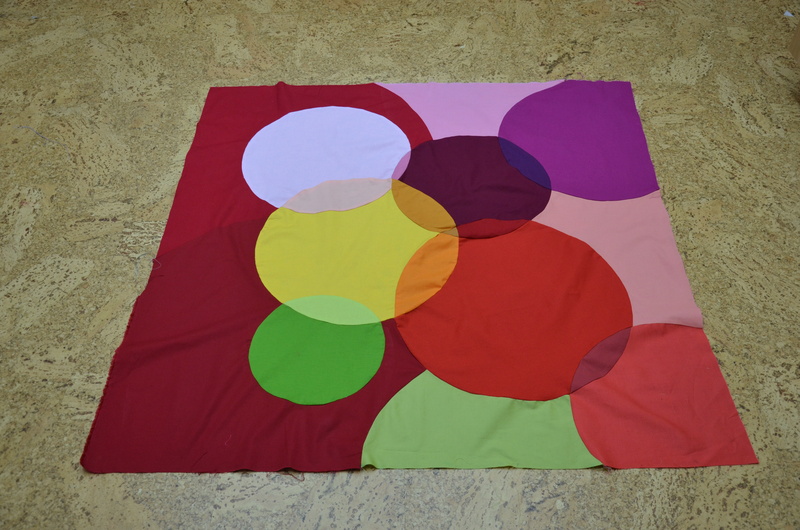 I did not want it to be an appliqued quilt, but inset circles. This is how I did it. 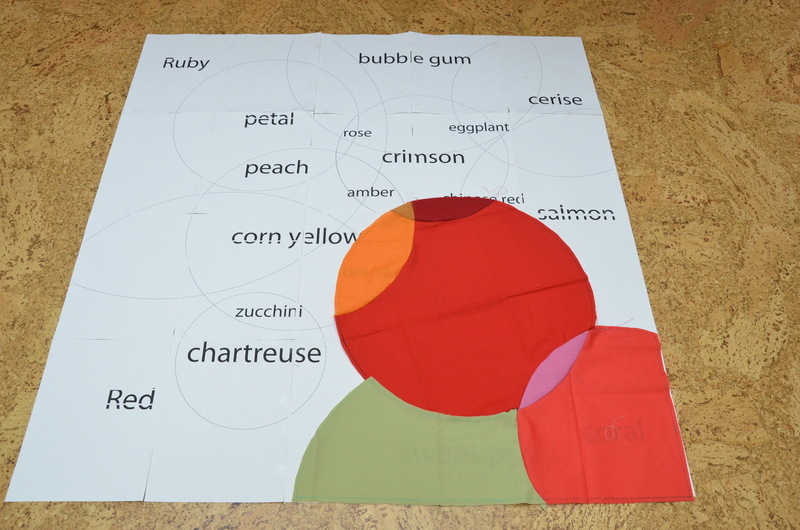 My most anxious piecing was putting the chartreuse, a nearly full circle, into the larger red bubble piece. It wasn’t nearly as scary as I had envisioned it to be. Isn’t that usually the case with the unknown? 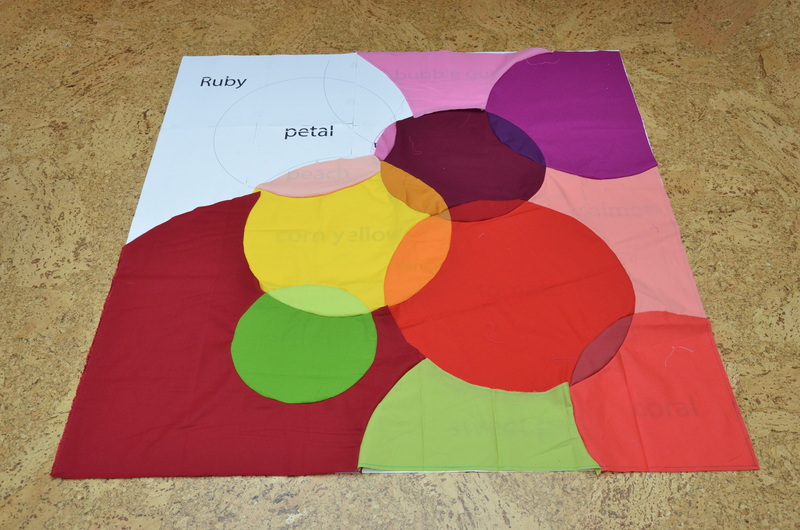 Then I used my trusty, handmade templates, used on so many other quilts, like this one and this one to mark concentric circles at 1″ intervals to hand quilt, usually while as a passenger in the car, one of my most productive places to quilt. Yes, I could have machine quilted it and been done that much faster. But what’s the hurry? Life is all about the journey, isn’t it? The back really shows off the quilting. I duplicated the arc, opposing it, from the front to use as a label. So check it out, if you haven’t already. My entry is #69. So much to see, sew and sigh over…. This entry was posted in 2012 completes, Bloggers' Quilt Festival, Quilting and tagged bubbles, festival, hand quilting, kona cotton, most popular post, quilting, robert kauffman, wall hanging. Bookmark the permalink. Isn’t the festival spectacular this year?! Gorgeous quilt, and an amazing answer to a design challenge. I love the label idea. Thank you. Normally I embroider the recipients name, the date and my logo (initials) on the front, but since this was a wall hanging I didn’t want it to complicate the design. Not sure I didn’t come up with this labeling idea sooner. Thank you, Jill, it was fun to make! Really interesting to see the planning you put into this quilt ( something I never do) and I love hand-quilting too so this quilt is a definite winner for me. Thank you! Once I had a handle on it, I really enjoyed working on it! what a beautiful quilt. I love the colours and how the circles overlap one another. Transparency was what I was aiming for. without hand dying it was as easy as I dreamt! just fascinating! I ‘m really loving the interplay between handmade and technology–kudos to you for figuring out how to make it all happen! It’s a beautiful quilt and I think your daughter could hire her services out to those of us who can’t do computer design for quilts!! I should probably hire my daughter out. You are right, there are probably a lot of quilters that would probably pay for what she does! Yeah, I’m clueless at 52 as far as computer programs! I love your hand quilting better than the original person’s machine quilting – does she know you made one?? Thanks, Kate! I didn’t notify her, maybe I should have? I love the template you and your daughter were able to come up with. The finished product is very impressive! WOW! Great quilt! The combination of technology, art and quilting is amazing! Thank you, Carol. I’ve been slow to make the change but things are changing whether I do or not! Love the process and the quilt! I commend you for piecing all those circle. Gives me hope that if I put my mind to an idea I can figure it out too. I agree with so many other comments. This turned out fantastic and I love your color choices. Even more, I love your attitude about hand quilting. I think that will be my new motto “what’s the hurry?”. I just have to keep telling myself that, Marjorie, or I’ll go crazy. All these other quilters appear to be putting multiple quilts out a week and I’m not. They aren’t hand quilting nor making big quilts, either. So what’s the hurry? While making, I’m not sure where many of the quilts will live, anyway. This is a brilliant quilt!!! How wonderful that you worked on this project with your daughter. I’m started to blush. You are so kind, thank you. Great secret weapon, I could really use an in house graphic designer sometimes! And the quilt turned out awesome. Thanks, Jill! She now works from home so is available, to me anyway, on an as needed basis! Your quilt is truly lovely!! Thank you, Jolie. It’s been a fun show, this year, I think! I’d love to see you give it a try! This is incredible! Amazing process and final result. Thank you, Ann. You are welcome and right. I always love to see all the different ways people can do the same thing! Amazing to see your journey to the completed quilt, which is bright and beautiful! I tend to just play with fabric and have such a difficult time graphing things out. Oh, Janet, I do tend to just play with and figure things out. This one was tough. I brainstormed for a long time thinking jumbo compass like, made from scratch tools, string on a pencil, you name it, before daughter said she could just draw them and I could print and cut perfect circles, just like that…. That what we get when we send our kids to college… LOL! Love the solids – well done for creating such a thing of beauty. Creating the feel of transparency was not an easy task, when limited to fabrics I could see in person!Thank you! This is an amazing quilt. I love that it’s so modern, too. thank you for sharing your process. it’s such a beautiful quilt. And i agree with you when you say ‘what’s the hurry?’ . the hand quilting is lovely! Some days I just can’t repeat it enough. Ha Ha! Don’t be jealous. Yours is so cool in a very different way. I love it! So beautiful…I love it. Thanks for sharing your process. Brigitte is brilliant. She comes up with some tough challenges, for sure. I am constantly looking for people to unstuck me! And daughter was an art student before she more narrowly defined her degree into a graphic designer, so yes, she is one I turn to often! Awww, thank you, Eileen, that means a lot to me. The festival seems over the top this year! Love it! This is just so gorgeous! Thank you and thanks for stopping by, Melinda! Thank you for stopping by my blog and commenting! Your quilt is so fun!! I admire you doing so many circles – and setting them in. It’s so fun seeing what everyone has been working on! Merci beaucoup pour acknowleging ça! The wall hanging is so beautiful! 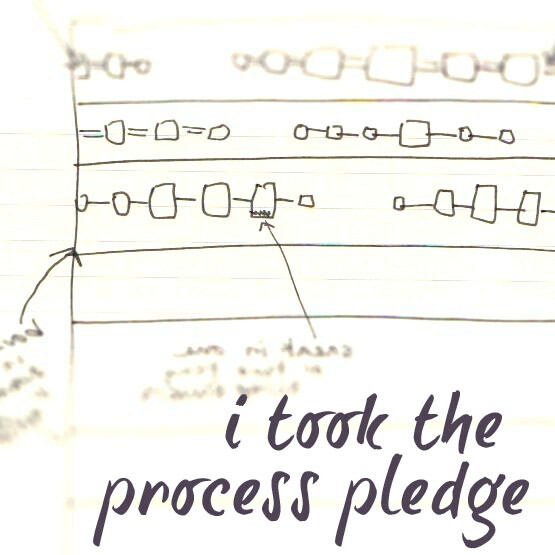 I’m always drawn to circles and I love that you involved your daughter in the drafting process. My mom and I quilt and design together and it’s so much fun! Circles just speak to me, for some reason. Quilting works across all generations, one thing I love about it! Amazing, thanks for the step by step photos, this is truly a work of art! This quilt is amazing! And what a design process! Lucky you to have such a helper too. Love that quilting. Hi! Thanks so much for your comment on my BQF quilt! I’ve seen this quilt you are showing before (in the making) on one of your previous blogs and it’s full of color and gorgeous. I love how the entire thing looks 3D. You really captured the flow between the colors! Thank you, Lily! Yes, this one was on the bench a while! A beautiful quilt. Thanks for sharing your process and you did a nice job with the curved piecing. wow!!!!! I LOVE your quilt! this is amazing work with color! lovely stitching! lovely design!…. This is delightful! (Man, that’s a lot curves!) I love it. No problem! This works and you got to see my blog in the process! Thanks, Tara! It sure was, keeping them all straight in a curvy manner was a challenge all it’s own. An explosion of comments! Holy smokes! This is a brilliant quilt Lori. I LOVE IT! Almost as much as I love the “stacked books” one 🙂 Always love to see what you come up with next! And I could have sworn no one outside our house had seen the stacked books quilt…. Eek one more unfinished quilt that I was in denial about that is *out* now…. This is so beautiful and creative! I agree, I love how this festival brings me to so many great new blogs and find all of these great people who make beautiful things! Your daughter is awesome too! Oh, I love your quilt, I haven’t conquered circles yet that aren’t appliqued. Beautiful, thanks. Well, I have conquered applique! Thank you! I nominated you for best pieced quilt and best hand quilted quilt. I hope you win! You really deserve it! That is so sweet Sarah! Thank you! I love that by creating the quilt, for your FIL, you are bringing him into your heritage! I love that about your story. Boy do I hope to get to Ireland someday! This is amazing! Absolutely one of my favorites! Thank you SO much Valerie! It means so much to hear what other quilters think! So blown away – the work that went into this leaves me speechless, as does the result. What a happy quilt!!! I was having the same problem, Rebecca. Thank you for the kind thoughts, though! This is so fantastic. I’ve actually wanted to do something very similar, but haven’t because of the planning and piecing. Thanks so much for sharing your process. I might need to add this to my list in the coming year or two. Great work! It’s gorgeous! I saw this on Farbstoff too and mentally put it in my maybe one day pile. You have done a fantastic job! Thank you, Vicki! You can do a Bubble Quilt, I just know it! Now stop that, you are making me cry. And don’t apologize for living your life! Most of the time I’m just talking to myself over here. It’s nice when I see people are listening! And really glad we are back in touch! This is absolutely gorgeous and inspiring! Thank you for sharing it! Wow, amazing finished quilt. Thanks so much for sharing your design process. For the first time, I understand the in’s and out’s of what it takes to design a quilt. I have so many ideas in my head for quilts, but, never got past the idea stage. After reading how you and daugther went from an idea to the finished quilt, I now feel like the little train that could. Thanks so much for sharing, and, thanks so much for giving me the push I needed to get my ideas moving. This is amazing! All those rounded seams… You got my vote!!! I love this quilt! I remember seeing it on Brigitte’s blog and thinking ‘but it would be so much more interesting pieced instead of applique!’ And now you’ve done it perfectly. I know from recent experience that fitting the background fabric all the way around can be tricky. 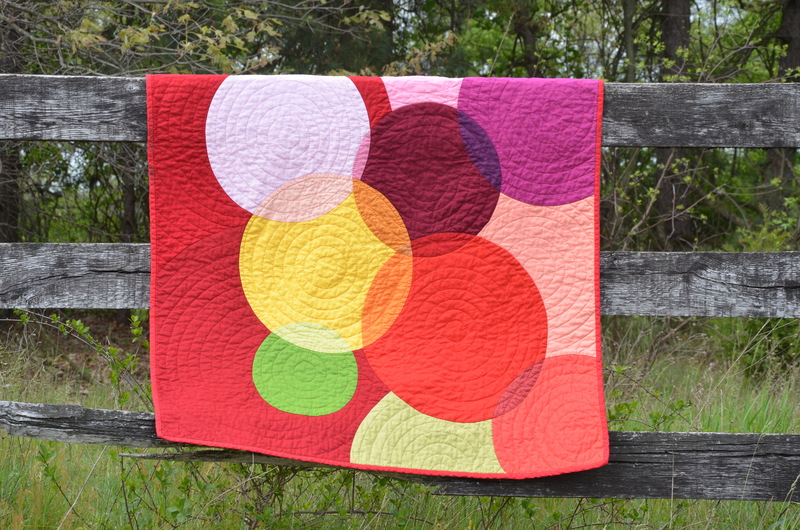 And the circle quilting is great. Congratulation on the win. This looks really beautiful! Congratulations. I knew you had to win. It’s an amazing quilt! Je me sens honor�. Je vous remercie! Congratulations on the win, Lori. It’s a beautiful quilt. I just noticed it is hand quilted. I admire your patience to do it. What a beautiful quilt! Very much worth the effort. That is such a beautiful quilt! I love the detail – especially how you made it look like the circles overlapped. Thank you, Beth! 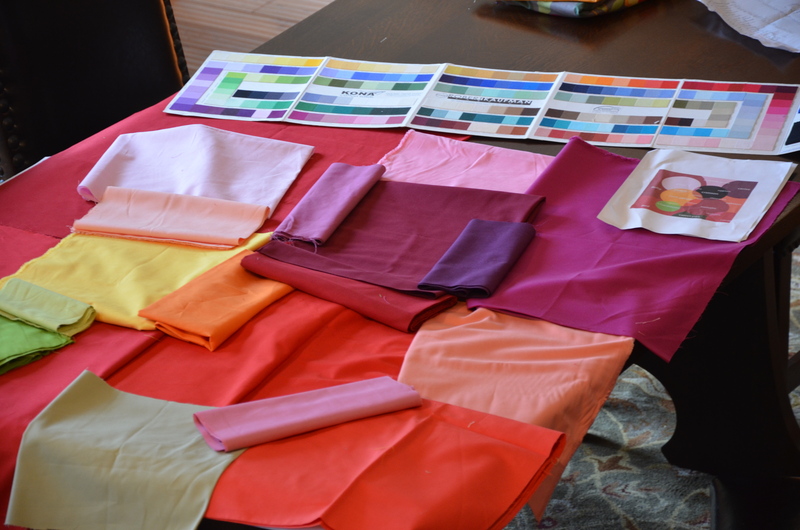 Without hand dying fabrics I, my color options were limited. I think Kona had a nice selection to give me the transparency I was looking for. Thank you for all your help, too. Hopefully we’re all learning some things, not just me! And Beth, this is the only comment, from you, I see. Thank you, Beth! Now I see this other message! I appreciate your input! This quilt is amazing! I wonder how I missed it in the spring. It’s sew fabulous! There are way too many quilts to see them all, but I definitely try!! Thank you so much for sharing your journey and process for this quilt. It was so inspirational. Love the colors. I absolutely love circles. And I always inset them. No appliqué, please. As soon as I have time, I’m going to try making one for myself.